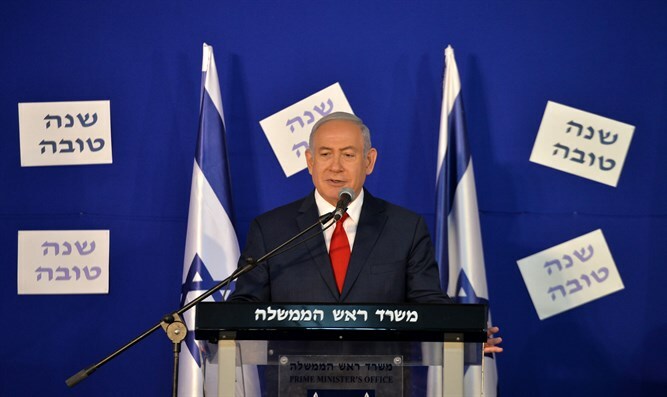 Prime Minister Binyamin Netanyahu attends toast in honor of Rosh Hashannah, says Israel's standing in Middle East, world improving. Prime Minister Binyaamin Netanyahu, today attended a toast in honor of Rosh Hashannah with personnel from the Prime Minister's Office . "We live in a challenging area – and we are equal to the task." Netanyahu said. "We hit our enemies when necessary and we are capable of hitting them even more. We are defending our borders and we are also dealing with threats while they are far away and have yet to reach us, with foresight, pre-emptively." The prime minister added: "But I must tell you that while we are doing this, we are acquiring friends around the world and within the region here. They see our strength and they see our commitment to defend our state, to develop it, and become an economic, technological, military and intelligence power, and this brings us friends. Who but you, the employees of the Prime Minister's Office, knows this? This tent is like a railway station; leaders from around the world arrive every day, sometimes several times a day, hundreds of leaders."